Experience the alternative to cosmetic surgery by safely and naturally achieving a significant reduction in weight along with sculpting your shape while eliminating toxic waste in 21 days. See what you can achieve in 21 days. 90 minute Orthopedic Massage $145.00. 30 minute Orthopedic Massage session on focused areas $55:00. Robert L. White, DIM is a Doctor of Integrated Massotherapy and a Licensed Massage Therapist. He holds many certifications in advanced body work that address soft tissue dysfunction with low force, non-impact techniques. He is a certified detoxification consultant and has also been trained in several alternative health modalities. You can see further information regarding his work by visiting www.Body1wellnet.com. I was not happy with my lumps and bumps here and there on my body. I did not want to have liposuction surgery so I began to search for other options. I came across the Washington Institute and called for information. After speaking to the director Victoria Goldsten I decided to sign up for a series of body sculpting massages with Robert. I was very please with the results. My body looked much more shapely and smoother. My cellulite was significantly less. Thanks Robert! Robert received his formal massage training at the Potomac Massage Training Institute (PMTI) in Washington, D.C., graduated in 2006 and received his national certification in 2007. 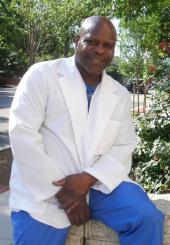 In addition he participated in the Georgetown University Mini Medical School, a program designed to create a peer relationship between students of medicine and massage. In 2008 he went on to further his career goal by attending the Institute for Therapeutic Massage in Pompton Lakes, N.J. where he studied Hospital based orthopedic massage, and had an opportunity to practice at the Robert E. Johnson University of Medicine and dentistry, Institute for Complementary and Alternative Medicine. In 2010 Robert joined the Washington Institute of Natural Medicine where his practice thrived, and he was named as the lead massage practitioner. At the Institute he studied many alternative medicine modalities including detoxification methods. Furthering his vision for the massage industry, Robert received his Doctorate of Integrative Massotherapy from the First National University of Therapeutics which is a federally chartered school and has been in existence since 1906, and known as one of the oldest schools that offer degrees in alternative medicine. Massotherapy (or massage therapy) is the treatment of disorders of the human body through "hands on" manipulation of the soft tissues. Massotherapy is also a kind of "preventative medicine." It is used to relieve physical stress and imbalance before they develop into serious problems. Within the Doctor of Massotherapy degree program that Robert L. White attended he studied advanced bodywork modalities. These therapies augment conventional medical care.